In the flatlands between Mill Basin and Marine Park, just before the avenue arrives at the golf course and Jamaica Bay, you’ll find VERG South, an emergency hospital for pets. Inside is a dog, which isn’t very surprising, this being a place for treating dogs and cats. Only this dog is famous. The dog came to VERG — that’s Veterinary Emergency and Referral Group — in a roundabout way. First the dog arrived at a vaccine clinic, probably hosted at a PetCo; the story is fuzzy at the beginning. One thing is certain, and terrible: the dog had owners. They brought him to get shots, which they thought might cure him. He was clearly very, very sick. Shots wouldn’t fix him. 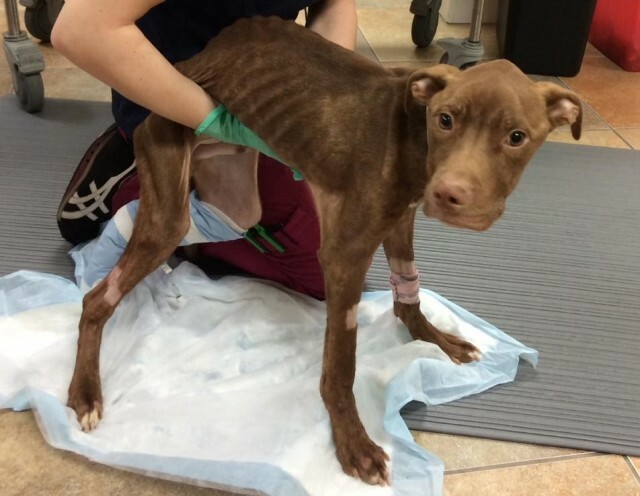 A veterinarian at the clinic saw the dog that wasn’t so much a dog as it was a bag of bones and knew she needed to step in. So she called Sean Casey, who does animal rescue all over Brooklyn. He came by at the end of the day, saw the pitbull mutt, saw that it was in a bad way, and told the owners they needed to relinquish their dog, that is: give it up. It wasn’t hard to do. He just told them how much medical treatment the dog would need, and how expensive that would be, and how neglectful they had been. Casey took the dog from them and named him Louie. Louie went from PetCo to Pet Haven, another clinic, where he lived for three days. While he was there, another veterinarian, Dr. Ford, took a picture of Louie and posted it to Facebook under which she wrote something like this is upsetting, people are terrible. Brett Levitzke, the medical director at VERG, saw the post and pictures of the dog and got really upset too. Levitzke has a springer spaniel named Toby and a cat named Broccoli. He got so upset at the pictures of Louie (emaciated, pockmarked, pitiful) he decided to take on the case, the case being Louie. That’s how Louie came to VERG South out near Jamaica Bay. What you have to worry about with a dog that’s been starving all its life is the the same thing you worry about with a starving human — a problem called refeeding syndrome. The patient’s body cannot process the sudden influx of food, becomes overwhelmed, and the patient dies. So the team at VERG had to be careful about how to go about feeding Louie. This wasn’t a problem on Louie’s end. His teeth were broken (from trying to eat rocks, most likely), he had worms, he wouldn’t drink, and he couldn’t lift his head, much less walk. He was just in rough, rough shape, everyone recalled. But the thing about this dog in particular was that he was so, so trusting. They had no idea what his past life might have been like, what abuse he suffered, but his eyes stayed bright and alert all the way through. You could tell by his eyes he knew what was going on, but he couldn’t move, could barely lift a paw, much less his whole head. He was maybe 10 months, a year old at most. They started him on fluids, calculated out how much food they could give him, tiny amounts, day by day. For the first ten days his tail stayed tucked between his legs. They put him through physical therapy, which was really just holding his body in place and moving his limbs, to begin to get his muscles back. They put him on antibiotics, which they delivered through a steam mask. They rubbed and smacked his chest to break up the fluids caught in his lungs from pneumonia. They bathed him, repeatedly, because he smelled awful. The first breakthrough came when he started to walk again. There’s a video of that moment. He only takes a step or two on his own, and the steps are wobbly and unsure. He looks a little like a newborn deer. VERG’s head of communications, Maria Moss Davidson, shot the video, and still takes lots of photographs of Louie, which she posts on Facebook and Instagram. “He’s kind of been my life for the last month,” she said. This is how Louie became famous. He’s photogenic. Those puppydog eyes, that wrinkled brow, he looks thoughtful and trusting and extremely sweet. Likes piled up by the thousands. People from all over the U.S., and then the world, wrote VERG. Many wished to adopt. A woman from Sweden persisted and had to be told, well, this wouldn’t be the best thing for Louie, seeing as he’d have to sit in quarantine for months just to enter her country. Also the fact is Louie wasn’t quite ready to go. Louie has a parasite still, and they’re treating him for diarrhea. He weighed 11 pounds when he first came in to VERG; he weighs just a hair over 30 pounds today. He’s nearly at optimal weight, but not quite leash trained, and not at all house trained. He has the run of the hospital. King Louie is what they call him now. They aren’t ready to let him go, either. “In a previous life, yeah. Ballet,” Kviker said. She’d like to bring in a hurdle and tunnel so she can do serious agility training with Louie. “He’d be really good at that,” she said. Kviker has been training dogs since she was 10. Just dogs in the neighborhood, then puppies that could become seeing eye dogs. “Now I only take on interesting cases,” she said. “A puppy is boring. My dog tries to eat people, or is terrified of everything — that’s interesting. What works is very, very slow desensitization, which means that if a dog attacks skateboarders, you get a skateboard and roll it across the floor very, very slowly, never going to a point where the dog is overwhelmed. And lots of food. Whatever motivates that dog, it doesn’t have to be food, but I’ve only met one or two dogs where food didn’t work.” She finished doing the weave trick. Ryan Bradley is a writer and editor in New York.